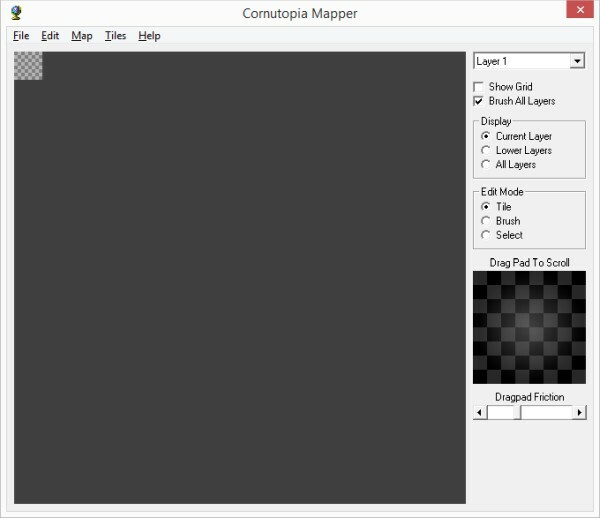 Cornutopia Mapper is a tile map editor. Use for editing and creating levels for many types of game. The mapper supports multiple layers, so extra information can be encoded and an unlimited amount of brushes, copy areas, can be used. Brushes are stored on a separate palette page for ease of selection. Map sizes from 1 to 10000 and tile sizes from 1 to 128 pixels are supported, including rectangular. Up to 8 depth layers for extra data. Cut/copy/paste on one or all layers and unlimited buffers. Support a wide variety of map formats including BYTE/WORD/DWORD and bit encoded layers. Export to ASCII, and import/export from a specific byte offset within a file. Many processing operations including flip, random fill from brush and swap tiles. The program is fully enabled and free for personal use. Please register below if you use the mapper for commercial projects.